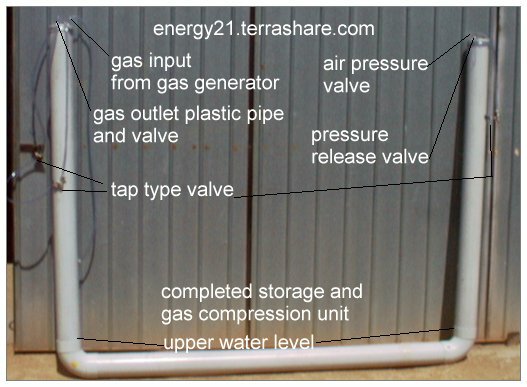 The complete gas collection and compressor. If you fill a closed container with an explosive gas mixture, as an example one (1) part oxygen and two (2) parts hydrogen you will have set the stage for accidental explosion. Hydrogen and oxygen can and will explode with violent effect. To know of this, and to teach this, and not carefully warn all parties is to ignore your place as scientific ethical investigator. This drawing shows the water level of bottom pipe at time of start up and when all valves on top of the unit are in the opened position. This piece of equipment is made from two four inch PVC storm water elbows. Two five foot long pieces by 4 inch pvc storm water pipe. One piece of pvc storm water pipe 6 foot long by 4 inch diameter. Two four inch endcaps into which are inserted some brass connection and then the inside filled with some fibre glass to make an air tight seal. All pipe pieces are then joined together with a normal PVC pipe glue making sure they are water and air tight. This endcap shows the bike valve and a brass hose connector inserted and then sealed into position with fibre glass. The completed end cap glue into position on the five foot length of storm water pipe. On all the brass pipe fitting in the end caps, I have attached a small clear plastic hose and then fitted a valve or a tap that can then be used to close and then to block the flow of gas or water. Please note the bike valve only allows you pump air into this vessel and this is only in a one way direction. To release the pressurized air, open the pressure release valve. Make sure you fill this storm water pipe unit with water to the level in the bottom section as indicated in first diagram above. If you under fill this unit it may not work correctly but slightly overfilling with water should not be a problem. 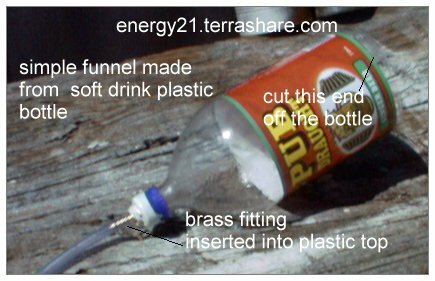 The 2 litre soft drink bottle is approx the same diameter as the storm water ,so you should be able to calculate how many times you need to fill this funnel to ensure bottom section of pipe is filled correctly. 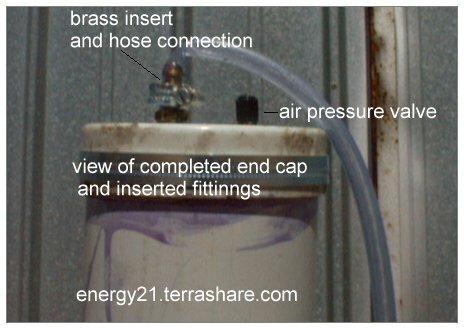 Start by connecting the gas output pipe from the gas generator to the gas inlet on this new collector as indicated on diagrams above (please see previous articles on the gas generator) and then open the air pressure relief valve on opposite upright pipe. 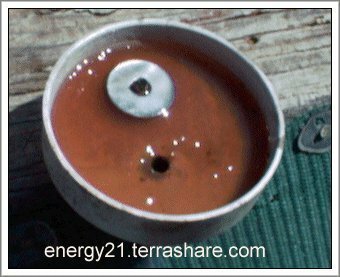 The hydrogen/oxygen gas thus produced will then force the water in the 4 inch pipe bottom section back upwards towards the other side. It may take a couple days to completely fill with hydro/oxygen gas if you use the same gas generator as described in my first article. If you see water coming out of the pressure release value you know you have a filled gas unit,although personally I would not let it get this far. When there has been enough gas collected you can then compress it. This is done by making sure all valves are shut especially the air release valve, and then by using a small bicycle pump or other means to place an increased pressure in the unit. 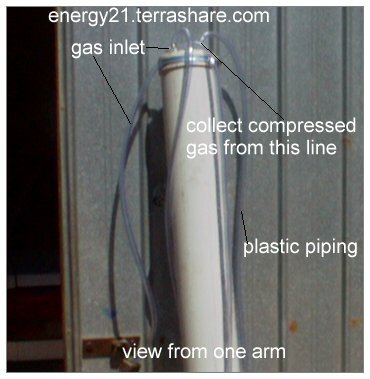 As water cannot be compressed this will force the hydro/oxygen gas in the other chamber to be compressed, the water in the bottom pipe section acting as a barrier between the hydro gas and the new air you are introducing by means of the bike pump. To recover the gas,open the hydro/oxygen gas output valve and the hydrogen/oxygen combination gas under pressure will be released. Or alternatively you can open the ouput gas valve and collect the gas as you pump air into the opposite chamber section by means again of the bike pump. Please note :You will need to purge all gas out of unit for the first gas compression period as you will still have a mixture of normal air and the hydrogen oxygen mixture and you will need to clear it out of the system. you should only need do this once.